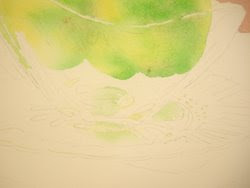 Today you will use the colors that you used in the previous application, but wet them so they are not quite so strong. We will paint these colors directly into the glass bowl where they are reflected. Be sparing; use a light touch. It is better to start out too light, especially when you are doing this for the first time. As you get more comfortable with glazing colors and where to put the colors in reflected objects, you can be more direct with color. For now, put in delicate color in just a few areas. Remember, the glass is reflecting what is around it, and it is sitting on a white plate, so there will be a lot of light in the glass bowl.